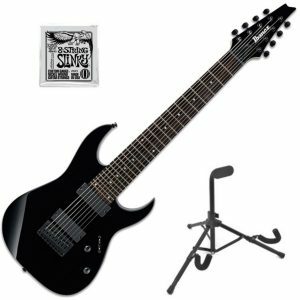 Our top selection is the awesome Jackson Pro Series Dinky DKA8M! We’re beginning this list with a brand synonymous with heavy metal guitars. And what’s more metal than an 8 string guitar in deep red mahogany? New for 2019, the DKAF8 X Series is a fresh take on the standard Jackson ‘Dinky’ series, yet still staying true to form. Spec: With a scale of 25.5″-27″, Jackson have kept this 8-string as close to the size, thickness and scale of the original Dinky. It’s imperative for metal players (or whatever genre you want to try with an 8-string) to have a thin neck, and the Dinky series is known for this specific feature. The thin neck sports a rosewood fingerboard, a 12’16 radius and 24 jumbo frets. The neck is also reinforced with graphite rods, capable of withstanding even the most blistering of solos. Hardware: The DKAF8 comes with stock dual Jackson humbuckers, which are ready to pack a punch. 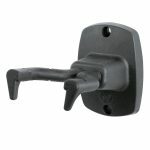 The pickups are crafted by EMG, and are capable of providing crispy high-ends and the crushing low ends for those heavy death metal rhythm sections. The DKAF8 is a fantastic beginners 8-string guitar, especially for players who are curious about the 8-string but are looking at spending less than 1000. With a solid mahogany body, a reinforced neck, and custom EMG pickups, the X Series Dinky is a great place to start. Staying on the theme of 8-string guitars for players on a budget, we can’t possibly leave out the RG8 from the hugely popular Ibanez RG series. More commonly know as the super Strat, the RG range began with the 6, branched to the 7, and now has its grip on the 8-string world. And why shouldn’t they? They offer amazing guitars at affordable prices, so let’s get in to what we like about the RG range (and also what we don’t). Spec: For the price, this guitar is constructed surprisingly well. With a basswood body and maple/walnut neck, it’s the RG you’re used to with the added F# and B strings before the standard 6 string layout begins. The basswood body is lightweight, great for shredders, and the neck is the standard 24 frets with a minuscule 200mm thickness at its thickest point. Strings are through-body for increased sustain, with a heavyset bridge that adds to the tonal range of the guitar too. 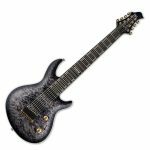 Hardware: The glaring difference between this RG and many of the others in the range is that this doesn’t have the Floyd Rose locking tremolo system. 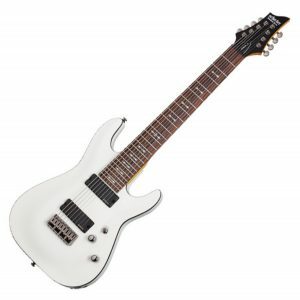 Whilst this is a great addition for shredders looking for those whammy bar dive-bombs, we think it’s a breath of fresh air to pick up an Ibanez guitar without the hassle of the locking neck. Pickups are the IBZ-8, which really seem to be suited to handle the low-end growl of the F# bottom string. 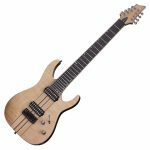 It’s no easy feat to create an 8-string guitar for players on a budget, especially when it comes to the hardware, but Ibanez have achieved it with the RG8. Price is of the essence with this guitar. 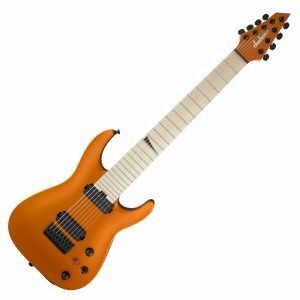 It’s common knowledge amongst Ibanez lovers that the lower-tier of the RG ranges are not of the uppermost quality, however the RG8 completely challenges these perceptions with a modern, agile and well-built instrument.If you’re shopping for an 8-string and want to keep the costs low, then make sure you don’t overlook the RG8. Let’s cut to the chase with this one. You’ve landed on the ultimate 8-string guitar buyers guide for a reason. And if that reason is to find the most bone-shattering, earth-crushing death metal axe on the face of the planet (under 500), then there’s no need to carry on scrolling. You’ve no doubt heard of Schecter, and if you haven’t, strap yourself in. The brand was arguably made most famous by Synyster Gates, with his 6-string signature line of curvy, sharp shred machines. But enough about that. The Omen is clearly named so because of the hellish tones that emerge from it… So let’s take a look behind the curtain and find out just how the Omen-8 delivers its crushing tone. Spec: The body of the Omen-8 is made of sturdy basswood, with that amazing vintage white finish that really helps it to stand out. The maple neck and rosewood fretboard is made unique by the signature Schecter inlays, with the dark maple tones making a nice contrast from the crisp white of the body. We don’t usually tend to obsess over colour schemes here, but this has been done to perfection. Hardware: The pickups on this 8-string are what many premium pickup lovers would call the budget version of the classic EMG humbucker, but there’s certainly no reason to turn your nose up at them. The HB pickups are favoured for the Schecter lower-end models because they can provide the heavy growl and punch that EMG’s can, but also help to keep the overall cost of the guitar down. If you’re not looking to blow your entire budget but still want an 8-string guitar that won’t leave you penniless (with awesome hardware and pickups), the Omen-8 is what you’re looking for. We highly recommend this one for metal players on a budget looking for a further challenge (especially if your standard 6 or even 7-string playing has grown stale). Well… How amazing does this guitar look! There’s no denying that the ‘Satin Orange Blaze’ is its true standout feature, but let’s have a look at what the Dinky DKA8M is made of, and more importantly, the hardware that makes it soar. And yeah, we’ve already mentioned another Dinky and we’re only at position 4 on this list. But we can’t get enough of them, and when it comes to 8-string guitars, it’s for a very good reason. Spec: The body of this guitar is a premium alder, resulting in a fantastically lightweight guitar which is suited for gigging musicians, especially shredders and metal players looking for a light guitar to shred on stage. The neck is a maple construction, which gradually gets flatter towards the top (allowing for fatter chord control at the bottom, and ease of shredding and navigation at the top). This whole build is already screaming out to the metal guitarist, so let’s keep looking and see the hardware behind this orange beast. Hardware: Seymour Duncan are praised for being arguably the most versatile range of pickups in modern guitar history. Whilst many players would prefer EMG pickups on an 8-string (and there’s nothing wrong with that), Seymour Duncan have come up with a challenger and serious alternative to the EMG humbuckers shredders love. The pickups are a Seymour Duncan ‘nazgul/sentient’ blend, done so for tonal versatility. Accompanied with a kill switch for controlling distortion tones and feedback, the list of capabilities of this compact masterpiece just keeps on growing. There’s a reason why this guitar is our favourite in this list, and it comes down to one word: versatility. ESP. See-Thru Black Sunburst. 8 strings of primed construction. A heavy metal guitarists dream. Not only does this guitar look the business, it sounds it too. Even the headstock looks fresh out of Hades guitar collection, so let’s get right in without further ado! Spec: ESP are renowned for crafting some of the best electric guitars, specifically for metal, rock and shred fanatics. For decades they’ve been at the forefront of the 6-string metal world, and now they’re branching out with 7 and 8-string models too. And why not? They clearly know what they’re doing… The H-408B has a mahogany body, super thin maple neck for optimised riffage, and a rosewood fingerboard to finish the sturdy build. 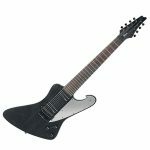 The LTD FM also comes in a completely unique See-Thru Black Sunburst, and with a longer scale length than most 8-strings (27 inch) this guitar can be tuned down for the ultimate death metal drop tuning melodies. Perfect. Hardware: Incase you haven’t guessed it already, the ESP H-408B FM is paired with EMG 808 pickups. Let’s face it, when it comes to higher-end metal guitars, the 808 humbuckers go with premium constructed 8-strings like Steve Vai and an Ibanez axe. The active humbuckers cut through any murky low-end, so rest assured that the standard F# of the 8-string can be dropped even lower. All in all this is a fantastic guitar, particularly for rhythm metal players or guitarists looking for a premium guitar with something extra. Stripping things back, we now have the Schecter Banshee Elite-8, another premium offering from one of the leaders of the guitar world. We really like this guitar as it’s not specifically branded towards metal guitarists, rather it’s kept minimal with a natural gloss finish, and a really one of a kind style. It’s also constructed from a one of a kind of material too, so let’s check it out. Spec: The Banshee is certainly nothing to screech about. Built from Swamp Ash with a glossy flamed maple top, the body is as sturdy as it light, and looks fresh out of the wood shop. The neck of the guitar is a maple and walnut combination, again adding to the overall build quality of the instrument. There are also the individual details about this guitar, such as the body styling and even the dot fretboard inlays like you’ve never seen before. Hardware: Sticking to the completely unique build construction, Schecter have opted away from the traditional EMG humbucker route and have instead opted for a new redesign of their original ‘Super Rock’ pickups, the USA Super Charger Mach 8’s. 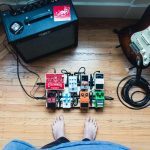 The split coil construction allows for completely diverse tones, so if you’re looking for an 8-string that isn’t a specific metal guitar, looks awesome, and has the hardware to support a range of tonalities and settings, then you know what to do. Woah. There’s no denying that this guitar looks the business. It reminds us of a Gibson Explorer, but with 2 extra strings and a body that’s been through a night of hard partying. We also love the metal scratchboard. And the headstock. Okay, this guitar is great, but enough of our gushing… Let’s get into why we like the FTM33 so much. This is part of what we hope is a new line of artist/signature Ibanez 8-string guitars. The signature guitar in question here is none other than the driving force of Meshuggah’s sound, the axe of choice for lead guitarist Fredrik Thordendal. So, why has Fredrik chosen Ibanez for his signature range, and what makes this guitar so great? Spec: If you’re a fan of the Meshuggah sound, then you’ll know that their guitar setup has to be as tight and well controlled as possible. The FTM33 is made of a solid ash-winged body, with a no noise thru-neck crafted from walnut and maple and a further titanium neck steel rod to aid in sustain and the supremely low tunings Fredrik likes to entertain. For many metal players, keeping tension once detuned is often an issue, therefore the titanium rod in the neck and superior quality body build has been specifically crafted to ensure that tension is not an issue, no matter how low you want to detune this guitar. Hardware: Tonal sustain is the core priority when it comes to pickups on the FTM33. As Fredrik switches from rhythm to lead, the pickups have be capable of both carrying the high-end notes, whilst maintaining a growl from a detuned 8th string without muddying the signal. The Lundgren Model M8P pickups achieve this, and much more. The FX 3 bridge again adds to the pickup sustain, with a 3-way switch for quick rhythm and lead changes. If you’re a fan of Meshuggah and have been looking for their signature heavy guitar sound, or if you’re simply a curios metal musician looking to get serious about 8-string playing, then we suggest you follow in the footsteps of Mr. Thordendal with his signature axe. Let’s talk nothing but precision. Having already covered the Dinky more than enough already, let’s take a look at the other 8-string offerings from behemoth manufacturer Jackson. This is the X Series SLAT8 FF Soloist in a no-nonsense gloss black finish. This guitar really isn’t messing around, so without further ado let’s look at what makes this the guitar for players who just want to tear up the fretboard. Spec: The primary striking feature of this guitar is the extended fretboard, which increases in length on the lower strings as the fretboard reaches its capacity. So what does this mean for the everyday shredder? 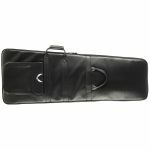 It means that, with an elongated footboard, the neck can maintain all-important tension, particularly for the lower strings. This allows the tension to stay low, so not only will control across the neck be easier, but also the pickups will be able to carry the signal across the fretboard with ease, without becoming muddy. The body of the SLAT8 FF is a basswood cut, with a deep neck on both sides for further ease of reaching those higher frets. The headstock and machine heads come in the matching gloss black colouring, with the standard simple Jackson logo finishing the minimal look. Hardware: Of course the X series comes with EMG 808 pickups. And why wouldn’t they? Not only do they have the tonal capacity and setup to capture the highest tones and the lowest growls, but they also look the part on an all-black guitar. It’s the little things… The hardware also includes a fixed bridge with staggered individual saddles, and a 3-position pickup configuration. The EMG 808’s also provide a surprisingly varied clean tone, which makes the X Series a fantastic all round guitar for players just looking for that little bit extra. Spec: Another ESP beauty crafted from the rare swamp-ash body, the JR-608 has a 5-piece maple/walnut/paduak neck, ebony fingerboard, and a fixed bridge with thru-neck for increased tonal quality and action assurance (great for detuning and shredding on the lower strings). Like many of their signature guitars, this 608 is made exactly to Javier’s needs, so if you are a fellow shredder in need of a guitar that will definitely stay in tune through countless drop tunings, bends and sweep picking sessions, then this is the one for you. Hardware: ESP have opted for the powerful DiMarzio JR-CTM signature pickups on this guitar. Due to the varying sound and tonalities of Animals as Leaders, the pickups have to be fully responsive and capable of delivering glassy clean tones and crushing bottom-end once the distortion pedal is stomped on. All in all, this is probably the most responsive guitar on this list. And it has to be. Made for shredders, by arguably the modern king of the shredders, the LTD JR-608 is diverse, capable of withstanding anything you throw at it, and it looks awesome too! The final guitar in our list is also the most expensive 8-string guitar we could find (still within reason). And why’s that you ask? 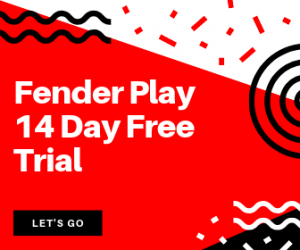 Because we want to give those of you out there with bags of cash to spend the opportunity to delve deep into a guitar worth it’s weight in gold. We’re talking about the beautiful Jackson USA Select B8 Deluxe 8-string in a smooth walnut satin finish. Let’s look at what this guitar is made of, the hardware, and why it costs as much as it does! Spec: Anything with a ‘Made in USA’ tag is always going to cost more money. 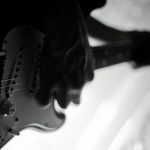 Whether that’s a Stratocaster, a Telecaster, or a Gibson SG, if it’s been crafted in the land of the free and the home of the brave, it’s going to cost a pretty penny. The USA deluxe 8-string is built from an amazing alder body, with a precisely quarter sawn maple neck and super strong graphic reinforcement rod, to ensure action and tonality never differs or is ever under too much stress. The ebony fingerboard is a comfortable 27” scale length, with 24 jumbo frets to get your shred on. A baritone body shape, the deep cutaway make getting to the higher frets easy, with a neck width that is very easy to navigate, even on an 8-string. Hardware: The pickups on this beast are a DiMarzio blend. We have the DiMarzio D Activator 8 DP820’s in the bridge position, and the DiMarzio D Activator 8 DP819’s in the neck. The 3-way switch is fully responsive and coated in a midnight black, which matches the tuning nuts and finish on the stripped-back headstock. All we can say for this guitar is…wow. Here’s a selection of our 5 favourite reviews for a selection of the guitars in our guide. Enjoy! You’re going to need some new gear for your 8-string. Below are a few suggestions to get you started, particularly the XL cases you’ll need to get to fit an 8-string in! What is the most common tuning for an 8-string guitar? 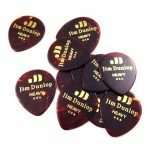 Whilst many metal players will use drop tunings (specifically on the lower strings), the common tuning for an 8-string offers a fantastic tone for metal rhythm playing too. The most common factory tuning is F#, B, E, A, D, G, B, E.
Are 8-string guitars actually worth it? This is a surprisingly common question, and we understand why you would ask. 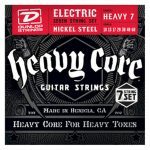 Are those 2 extra lower strings actually going to make a difference? 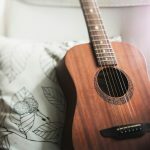 The answer completely depends on the type of guitarist you are, and what you look for in a new instrument. We strongly recommend an 8-string guitar for metal rhythm players, and for fans of jazz and experimental guitar who are looking for something a bit different. So in our humble opinion here at Guitaarr, we say yes. They are totally worth it. Is an 8-string guitar hard to play? Surprisingly, the width of the neck on many 8-strings is not as wide as some may think. Having said that, whether you’re getting a 7, 8, or even a 9 string guitar, there’s always going to be a turning curve as there are now more strings to contend with. What are 8-string guitars for? According to the wiki article, 8-string guitars originated from classical and jazz use. 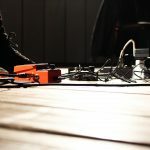 However, modern day metal and rock guitarists favour these guitars as they allow for lower tones, and mean that players do not have to detune their guitars when playing live as the added strings already provide the detuned effect. 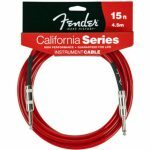 Fender Stratocaster VS Fender Telecaster – Which Should You Choose?